Attention singles!! Looking to meet someone special for Valentine’s Day? Here’s how! Diet Dr. Pepper and Dave & Buster’s Times Square have the perfect romantic opportunity for you Tuesday night February 10th. It's Love at first sip with Diet Dr Pepper. Enjoy a delectable buffet, Sip on Diet Dr Pepper, Meet that someone special, and win a trip to Paris, France. Log onto http://dietdrpepperdate.yahoo.com/ or http://www.daveandbusters.com/ to register today and for more information. 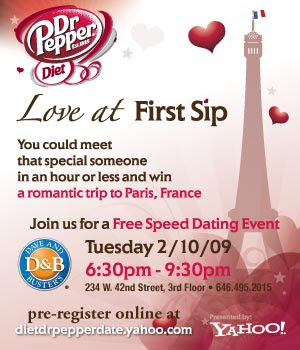 Then, get yourself to Dave and Buster’s Times Square, Tuesday, February 10th from 6:30p to 9:30, where Diet Dr Pepper put you in play for a Speed Dating game to meet that someone special and have a chance to win a trip to Paris, France! Bring LOVE into your life this Valentine’s Day by joining Diet Dr. Pepper and Dave & Buster’s speed dating event.